RMW Rates – The Glam Hatters’ Hen Parties. This afternoon we have a little hen do party inspiration for you. Janie Lawson is the professional milliner and all round talented lady behind the Glam Hatters fascinator workshops. Hello I’m Janie Lawson (@glamhattergirl), the Glam Hatters’ creator, teacher, milliner, wife to the gorgeous Peter and Mummy to my tiny Glam Hatter Girl Lottie. I love my work and have made it my mission to bring fun, fascinators and vintage afternoon teas to as many gorgeous hen parties as I possibly can. 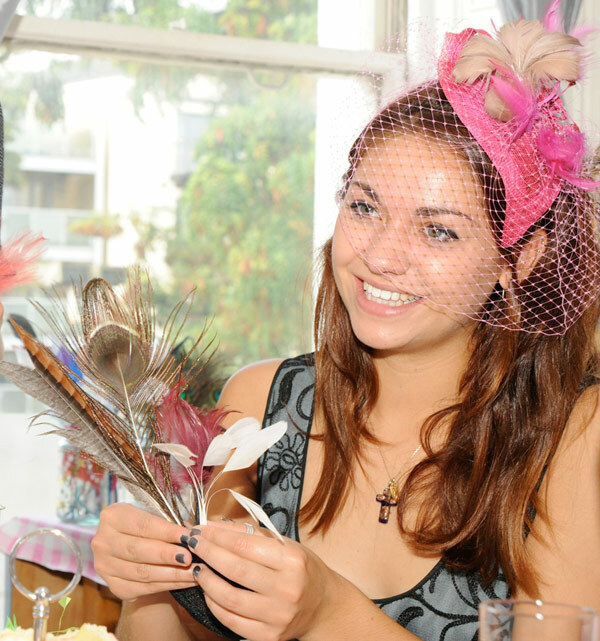 The Glam Hatters’ fascinator workshops are pure fun and a brilliant hen party idea. Designed by me and taught by my highly skilled and fabulously fun Glam Hatters’ teachers. All the workshops are suitable for any level, even if you’ve never picked up a needle in your life! Choose from a dressing up box of gorgeous feathers, veiling and trimmings, get crafty and you will come away with a beautiful fascinator to wear to the wedding. Our hen parties are held in my London studio or a venue of your choice. The London studio is a four minute walk from Clapham North tube, a genuine millinery studio full of hats and materials to inspire you. Housed in a bohemian chic art studio. Our Glam Hatters’ girls also travel nationwide bringing the Glam Hatters’ hen parties to a location of your choice. We have three packages, Silver, Gold and Platinum. We have also just launched a fourth hen party, “Make a vintage inspired head-dress or necklace”. It’s a three hour workshop with a break for vintage afternoon tea. This is a two and a half hour workshop with a break for vintage afternoon tea. Each hen chooses from a huge range of coloured fascinator bases and our Glam Hatters’ teachers will show you how to add on fabulous trimmings, create a birdcage or scrunch veil and add gorgeous beading to create a beautiful fascinator. As afternoon tea is not included in this package you are very welcome to bring your own bubbly, nibbles and cakes. This is a four hour workshop with a break for vintage afternoon tea. Each hen will make a fascinator from base to decoration using luxury feathers, beading, materials and veiling in a huge range of colours. This workshop is perfect for all levels of experience. 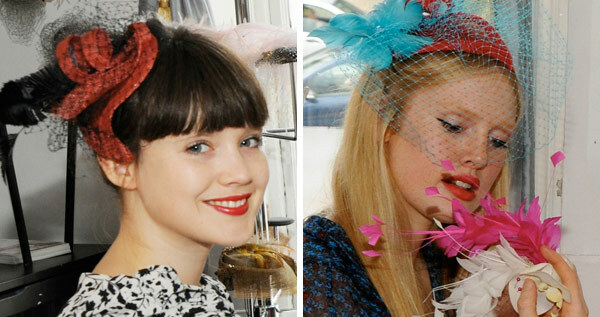 The Glam Hatters’ teachers will take you through step-by-step helping you to create a stunning fascinator. As afternoon tea is not included in this package you are very welcome to bring your own bubbly, nibbles and cakes and we will plate them for you using our lovely vintage china tea sets, cake stands, and bubbly flutes. The Platinum Package – 4 hour workshop with Maison Blanc afternoon tea provided. During the four hour workshop each hen will make a fascinator from base to decoration, using luxury feathers, beading, materials and veiling in a huge range of colours. This workshop is perfect for all levels of experience. The Glam Hatters’ teachers will take you through step-by-step helping you to create a stunning fascinator. Half way through this four hour workshop you are served with a beautiful Maison Blanc afternoon tea on vintage china. Each hen is served, per person a mini Chocolate Éclaire, mini Apricot Almondine, mini Lemon Meringue, mini Chocolate Brownie and a mini Millefeuille Framboise, plus three types of tea, coffee, milk and sugar all plated beautifully on our vintage china and tea sets. We will also provide a complementary glass of Prosecco on arrival and during the afternoon tea. If you decide to book a Glam Hatters’ hen party you will see that this is more than a job for me and The Glam Hatter Girls – this is a party and we want you to have the best time! P.S. Sign up for my mailing list via www.glamhatters.com or Like us on Facebook for weekly millinery video tutorials, wedding and fashion ideas, and snippets of gossip! This is a Rock My Wedding sponsored post by the Glam Hatters.